Many medium-sized companies in Germany also form the economic foundation and hold their ground in the tough competition in the extraction and processing of rock products. A typical example is Otterbein Zement- und Kalkwerke GmbH & Co. KG, located in Großenlüder-Müs, north-west of Fulda in the state of Hessen. The family business has been extracting around 500,000 t/a of shell limestone at this quarry since 1889. As the experienced manager of the quarrying business, who has himself been drilling at Otterbein for more than ten years, Bernhard Pfohl is well aware of the importance of using the right machinery. The decision in favor of the Sandvik Ranger DX800 surface top hammer drill rig therefore met a crucial need for a high level of professionalism. “We cannot afford to make any mistakes, particularly in investing in such a niche technology,” says quarry manager Pfohl, adding: “We maintain only one drill rig, which as an indispensable key piece of equipment represents a kind of bottleneck at the start of the production chain.” That being so, the company did not take the decision in favor of the new drill rig at the start of this year lightly, and short-listed a total of three competitors. 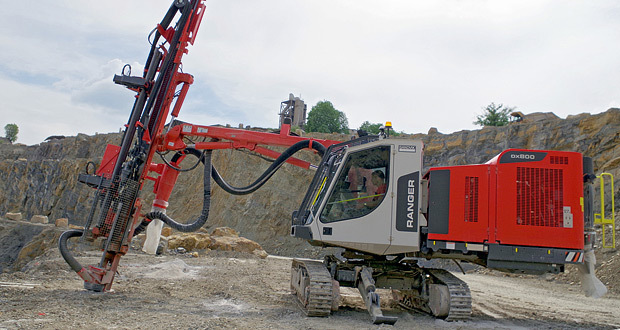 The Sandvik Ranger DX800 (Figure 1) also came out on top because the operating conditions at Otterbein in Großenlüder-Müs are anything but simple. 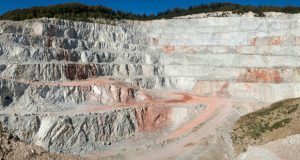 The geology in the quarry is extremely complex, with closely alternating dips of intensively disrupted layers. Associated with this geology there are often crevices and fragmentary edges on the work horizons. As an outstanding unique feature, the Ranger offers a superstructure that can revolve up to 180°. This is a function that Pfohl puts to use in daily practice. “By swivelling the rig I can cover a substantial working area of up to 26 m² without having to shunt laboriously in the danger area close to the tearing edges. As a result, a substantially greater distance from the abyss can be maintained, and yet I have an optimum view of all the drilling points.” The irregularity of the layers means that the quarry manager is repeatedly faced with fluctuating specifications. In addition, the range and mobility of the Ranger DX800 at the drilling point are expanded by the standard articulated drilling arm. The extraction concerns the whole sequence of shell lime. Widely varying types of rock with extreme differences in consistency are added to geology that is already complex. For this reason, Pfohl chose the version with HF820T optional high-frequency hammer, with which drift output can be increased by up to 10 % if necessary. When, at the other extreme, such soft layers are encountered that the drill rod sags downwards, so that the drilled material cannot be removed quickly enough, the automatic idle blow protection of the Rock Pilot+ control unit comes into effect immediately. Operating conditions at the Otterbein quarry are made even more difficult when slippery surfaces form in the quarry after rainfall. Pfohl is able to improve the stability of the rig effectively using the optional extendible solid prop on the chassis. In addition, the superstructure can be tilted hydraulically against the crawler frame in the direction of travel to ensure displacement of the center of gravity for optimum stability. 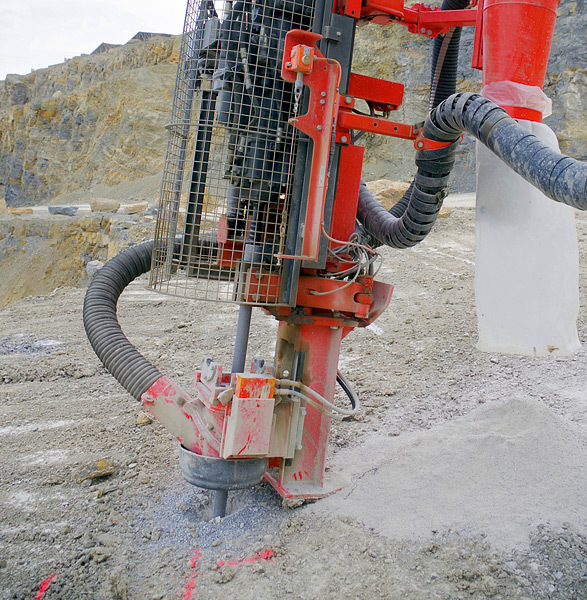 “As well as in drilling, I utilize this option in resetting the rig, when I can align the superstructure against the vertical on the steep slopes,” the quarry manager explains. This greatly assists the driving safety and mobility of the Ranger DX800. Despite the solid construction of the most important components, with a total weight of just 16 t the rig is easy to transport and easy to shunt on the crawler chassis. The comprehensive concept goes into details here. The standard safety equipment of the Ranger DX800 also contains a newly developed protective cage on the mount (Figure 2), with which Sandvik closes the gap in possible sources of danger on the moving parts. Unintended intervention in the circulating operating process can thus be reliably prevented.